Culture shock is an inevitable part of moving to a different country and sometimes we could all do with a helping hand. The Xenophobe’s guide to the… series provides up to date cultural insight into some 30 countries around the world, from Norway to New Zealand, Canada to China. Hopefully helping to make the transition a little less daunting, by humorously highlighting the way in which the way of life varies from one country to the next. 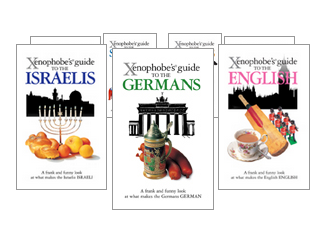 Light-hearted and somewhat tongue in cheek, Xenophobe’s guides provide affectionately written introductions to the peculiarities of different nationalities. Written by either local experts or natives, the guides aim to aid understanding of cultural differences; and reinforce that they are something to be celebrated and embraced, not dismissed as merely foreign and strange. National stereotypes are played upon and poked fun at time and again, but prove, more often than not, to be fairly accurate. These national characteristics are shown to contribute enormously to the idea of cultural identity. The guides touch upon all aspects of different countries’ cultures; from customs and traditions to local cuisine, the local people’s attitude towards their health to the way they get their kicks. So if you’re getting ready to embrace a new way of life, best leave your own habits and customs at arrivals. Xenophobe’s witty yet insightful guides offer an excellent starting point for the uninitiated, or just a thoroughly entertaining read for those already familiar with the oddities of other countries. Want to find out more? Check out our review of Xenophobe’s guide to the Spanish. Should we hide our foreign origins?